Welcome back to week two’s playoff picture. Hopefully, you enjoyed last week’s even if you found the rankings different from anywhere else. You will see a lot of changes this week (I can’t stress enough that the first few weeks will be extremely volatile). All of the disclaimers that applied last week still apply, and will apply. For those that didn’t read last week’s article, the major thing to keep in mind that these rankings are based entirely on what has happened on the field to this point, and how teams have played relative to the competition they have played. Another big thing to bear in mind is that these are not predictions, they are how I would rank the teams and pick the bowl games if the season ended today. The Buckeyes looked great in the second half of the opener against Virginia Tech, and carried that over into this week. They blanked Hawaii who was coming off of a win against Colorado. Cardale Jones and J.T. Barrett both saw significant playing time and it will be very interesting to continue monitoring the quarterback position, although Cardale is the starter and that seems unlikely to change. In other news, Ezekiel Elliott put in another 100-yard rushing performance and had three scores on the ground. While Clemson hasn’t exactly reached the meat of their schedule yet, what they have done against the competition they have faced so far has been impressive. If Deshaun Watson stays healthy, then this team is a legitimate playoff contender. The Tigers did start slow against Appalachian State, who is a good Sun Belt team for whatever that’s worth, and if they continue to do that they risk falling into an insurmountable hole against the Georgia Techs, Notre Dames, and Florida States on their schedule. “Swag” Kelly will get the first real test of his Ole Miss career on Saturday. The Rebels go into Tuscaloosa with plenty of talent, confidence, and offensive firepower. One thing that has plagued Ole Miss in the last few games against Alabama has been an inability to run the football. That’s got to be a key to success on Saturday, and Kelly’s ability to stretch the defense with his arm might be able to open up the field for the backs. If Ole Miss can pull off the upset this weekend, it would mark the first time that the Rebs have won in Tuscaloosa since 1988 and the first time ever to beat the Tide in back-to-back seasons. USC fits a similar mold as Clemson in terms of schedule structure. Idaho and Arkansas State can hardly be called heavyweights, although Arkansas State, like App State, should be a good Sun Belt team and only lost by seven to Missouri this weekend. However, the way that USC has beaten those teams has been what’s impressive. The Trojans have topped 50 points and allowed less than ten points in both contests. Cody Kessler continues to be an exemplar of quarterback efficiency completing 78.9% of his passes in the young season with seven touchdowns and no interceptions. As if anybody needed a reminder of how unpredictable a sport college football is, how about the fact that the two teams currently in the Rose Bowl, by my “infallible” estimation, weren’t even predicted to make a bowl game by some or most prognosticators? 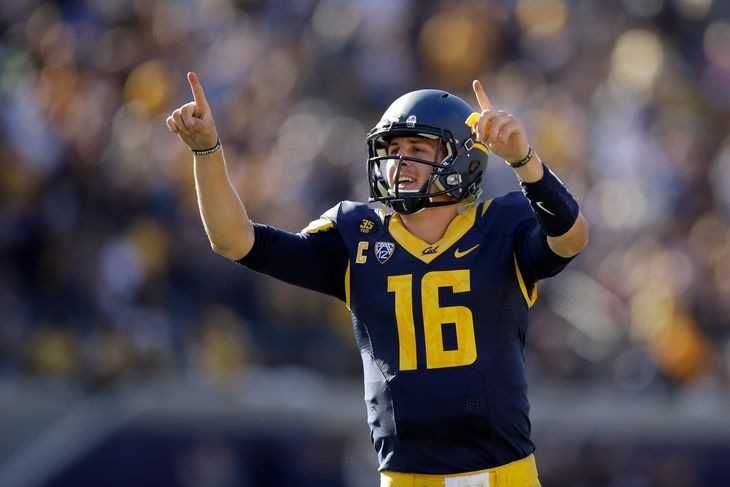 Cal gets their first “test” of the season with a trip to Austin to take on Texas. Their offense is potent enough that if they can turn the game into a shootout then they are virtually assured of a win considering Charlie Strong’s group has all the firepower of a water-logged book of matches. Now to our favorite story of the season to date. The West Canaan Fighting Illini continued their winning ways over the weekend by shutting out Western Illinois. Now, Wes “Mox” Lunt has to lead his team on the road for the first time this season with a trip to North Carolina. This is definitely a winnable game, and a win in this one would go a long way towards solidifying Illinois’s status as a program on the rise against long odds. Bill Snyder just continues to put winning teams on the field, and while Oklahoma easily had the biggest win from the conference in week two, Kansas State has yet to give up a touchdown this season. The Wildcats have one final non-conference game against Louisiana Tech before entering conference play. It should go without saying that if K-State wants to stay in this spot, then they will need to continue playing well against stiffer competition, particularly on defense. On the flip side, the Aggies have already had their first major test of the season and they passed with flying colors in a 38-17 win over Arizona State. Texas A&M looks much improved from last season defensively, and Myles Garrett looks like a quarterback-destroying machine. Kyle Allen also looks impressive at quarterback, despite being temporarily benched for Kyler Murray in the Arizona State game. Murray exhibited some playmaking ability, especially with his feet, but sticking with Allen is the right call. Do you love option attacks? Then this is the game for you. This would also threaten to be the quickest Peach Bowl in history. Get ready to buckle up those leather helmets and take a step back in time. Air Force has been the most impressive Group of Five team so far, and may have a chance to actually win the Mountain West, especially if Boise State’s offensive woes persist. Georgia Tech is only averaging 67 points per game through two weeks. Not quite as impressive as Ole Miss’s 74.5, but impressive nonetheless. They have also managed that basically playing their starters for only a quarter. 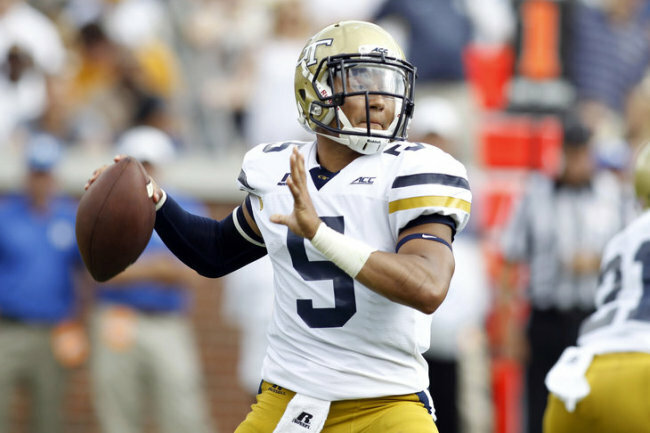 Justin Thomas might be the best triple option quarterback of all time, which is a pretty bold statement, but considering that the majority of his competition retired from football 40 years ago his athletic advantages are pretty undeniable. The Yellow Jackets also have their first big game of the season on Saturday with a road game against Notre Dame. Coming off of a major road win, people in Norman must be feeling pretty good this week, and they should. However, there is always something that can be improved. Oklahoma’s offense took forever to get going Saturday night, and when you play in the same conference as Baylor and TCU starting slow is a good way to get blown out. Baker Mayfield does seem like a good fit in the Air Raid offense Oklahoma wants to run. Many people have criticized Florida State’s rise in the polls after a “pedestrian” win over USF. The fact of the matter is that the Seminoles have done what they should have done against the competition they’ve faced, which seems to be a theme this week. Dalvin Cook has been especially impressive so far, on the field at least, rushing for 422 yards and five touchdowns through two games.